Biblical scholar, professor, pastor and academic administrator, Dr. Charles C. Ryrie has a lifetime of experience in serving the advancement of Christ's kingdom in the wide variety of churches and institutions he's served. With a pastor's heart and academic's precision in rightly handling the Scriptures, he has produced a living legacy of works that are widely read on the academic and popular levels. By a special arrangement with Dr. Ryrie, Biblesoft is pleased to release a 23-volume set of this contemporary master's works that make theology relevant and applicable to life, faith and discipleship's most challenging issues. At the core of this collection is the Ryrie Study Bible which is based on the New American Standard Bible Updated Edition. Also included are 29 of Dr. Ryrie's academic articles as first published in Bibliotheca Sacra, Grace Theological and Emmaus Journals. Other important new titles include; Biblical Answers to Tough Questions, Making the Most of Life, Neoorthodoxy, Ryrie's Concise Guide to the Bible, The Best is Yet to Come, The Christian and Social Responsibility, The Final Countdown, The Grace of God, The Role of Women in the Church, What You Should Know About Inerrancy and What You Should Know About the Rapture. Added to Biblesoft's already popular Ryrie 10-volume Collection are 12 new titles -- all rare finds in print -- and 29 of Dr. Ryrie's Academic Articles. 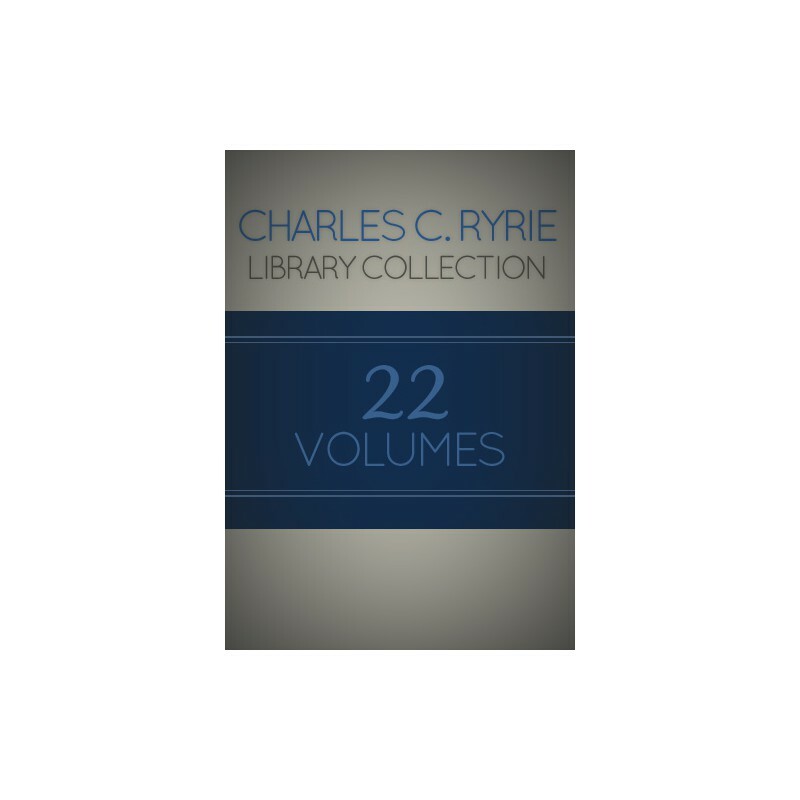 If you have already purchased the Ryrie 10-volume collection, please contact Biblesoft Customer Service for a full purchase price credit toward the 23-volume Ryrie Library Collection. Throughout his distinguished career, Dr. Charles Ryrie's articles in academic journals and popular periodicals have shaped and clarified theological topics, biblical texts, contemporary concerns, and doctrinal controversies. Should a Christian Be Afraid? Why Sacrifices in the Millennium? What does the Bible say about the future of the world? Wars, rumors of wars, famines, earthquakes, and other disasters are becoming increasing fixtures of daily life. What can be known about the events and timing of the end times? The Bible has the true answers to these questions which Charles Ryrie explains in clear and easy-to-understand language. Demystified are prophesies relating to Russia, China, Europe, the Arab nations and Israel. Also what is known about the end-times role of the church in world affairs. All of the chapters are carefully researched and provide a wealth of information relevant to the confusing statements made by so-called prophesy experts about events revealed only in and through God's sovereign timing. In this title, Charles Ryrie has tackled twelve of the toughest, most frequently raised topics of concern among Christians today. These highly credible responses are a precious resource in a world of confusion and opposing talking points. Make sure you have answers that are biblical and defendable. Each chapter is direct, easy to follow, and to the point. Ryrie cuts through the fog to expose the key biblical criteria behind each conclusion. Because the toughest questions deserve your very best answers, read this volume and know what to say the next time you're on the spot. Bible prophecy has become big business featuring many so-called prophets claiming to speak the truth for God. Charles Ryrie debunks those who abuse and pervert the truth as "prophesy quacks" and sets out to help his readers become careful students of prophesy. This authoritative content will help extend your knowledge of those who have genuinely spoken for God and how to interpret and apply prophesy to today's context as it stands in God's view of eternity. The Grace of God traces the Hebrew and Greek words for "grace" throughout the Old and New Testament life and times. The place of faith is demonstrated in the Old Testament along with the relationship of election and grace in the Mosaic law. The New Testament section delineates the particular functions of grace through various passages with emphasis on the Pauline concept of law and grace. The book concludes with an excellent pair of appendices: "What is Legalism?" and "What is Liberty?" Life is precious, but certainly not easy for a young person to live the Christian life today. The same was true in New Testament times. The government was corrupt, sin was rampant and open, homes were not always godly, and many believers were slaves. In times when immorality, government corruption and lack of compassion seem to be the norm, God still expects believers, young and old, to live godly lives. Learn how New Testament principles of godliness are just as workable today as they were in the first century. What is neoorthodoxy and how does it affect those who subscribe to its strange and often hard-to-understand tenets? In this very popular and critically important title, Dr. Ryrie expertly frames the theological question and links it to the person in the pew. While giving Karl Barth credit for his emphasis on supernaturalism in opposition to the humanistic theology of his time, the author offers a strong critique of Barthian theology concept that the Bible merely attests to revelation -- it is not revelation in itself. Dr. Ryrie correctly identifies and confronts the errors in Barthianism and provides a strong, biblically-based defense of evangelical theology and its importance in correctly interpreting the Scriptures. At the time of this book's release, it dealt with a subject that had previously received little treatment. It is still a useful tool for providing biblical direction to the church for the role of women which is in keeping with the guidelines laid down by the Bible. The Role of Women in the Church is an inquiry into the practices of the past through ancient Greek, Roman, and Jewish cultures and is followed by a three-part discussion dealing with the effect of Jesus on the status of women during the apostolic age, and beyond. Here is a timely title that deals with the role of women through the Bible, founding of the church, and now in contemporary life. Study questions at the end of each chapter help to reinforce and focus the content into memorable information points. What makes the Bible the same authority for millions of Christians in totally different cultures? How did Christ use the Bible of his day? What about problems in the Old and New Testament? How can we most profitably study the Bible? The answers to these questions, plus an unusual question-and-answer approach to each book of the Bible, makes this book a unique contribution to an understanding of the Bible. 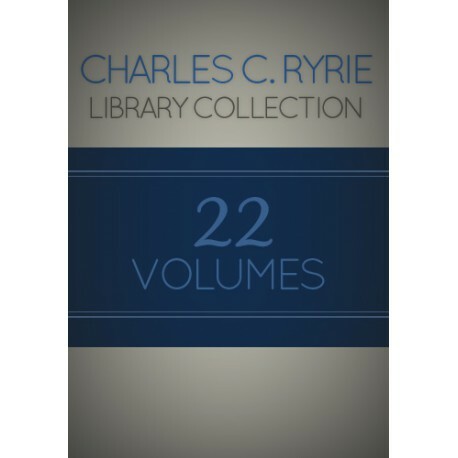 Recognized for his ability to present significant ideas simply and succinctly, Charles Ryrie has combined many years of teaching the Bible and theology as well as a special interest in collecting unique Bible editions, to produce an invaluable introductory guide to the Bible. Your concept of God can become worn thin by years of familiarity, hard circumstances, or a society that frowns on his uniqueness or even his existence. But when you lay aside these threadbare images and return your gaze to God's awesome character, you come away not only refreshed but inwardly different. In this book Charles Ryrie turns your thoughts specifically to the glory of God. It's a subject little written about and perhaps even less understood, but in his gifted way of making dry theology everyday practical, Dr. Ryrie clearly explains what it is, how it changed the men and women of Scripture, and how it can change you. If your Christianity hasn't been making a difference lately, perhaps your idea of God has lost its glory. Allow this book to help you reflect anew on his glory now and to encourage you that one day you will see that glory face-to-face. You won't be the same tomorrow. In this title, Dr. Charles Ryrie builds a case for belief in the Bible as the inerrant word of God must occupy a place of primary importance in one's doctrinal system. Even if one part of the Bible is thought to be false, how can any of it be trusted as true? Through convincing facts and explanations, Dr. Ryrie proves to readers that God did not permit man to divert, misdirect, or erroneously record his message. The Bible, the entire Bible, is inerrant and can be trusted to be totally reliable. How are we to be salt and light in today's world? Dr. Ryrie gives insight into how followers of Christ can imitate his personal priorities while serving others and maintaining a responsibly biblical witness in matters of civil justice and social compassion. Dr. Ryrie addresses pertinent questions on the Church's social responsibility in answering. Does Christ not command social service to all men? Should we insist on justice because God is just, or deny our rights because God is longsuffering? How will the believer know which is the proper course of social action at a particular time? Should wealthy persons disperse their possessions? This title is a must for those who desire to determine the extent of their involvement in today's world. It is informative and challenging. There's no doubt of the importance of understanding the portions of Scripture describing eternity-future. Where we are going is straight-forward, but often complicated on how we'll get there. Dr. Ryrie systematically takes on the rapture question and related topics of eschatology with scholarly precision, but in such a way as to be understandably-clear on the key points of each position and its impact on daily life between now and Christ's return. What You Should Know About the Rapture will help you to make the most of your talents and treasure to serve in the advancement of His completed kingdom. The following 10 volumes are now included in the 23-volume Ryrie Library Collection. A Wealth of Detailed, Accessible Information Charles C. Ryrie's years of study, teaching and writing make him exceptionally qualified to help readers grasp the Bible's fundamental truths. The Ryrie Study Notes -- Expanded Edition has unique features that make it an over 2 million copy best-seller. This 1995 expanded version of Ryrie's work features 10,000 concise explanatory notes and includes an amazing array of other indispensable information that is acclaimed for its scholarly nature yet understandable, easy-to-read format.Excellent outlines, book introductions, and quality notes, as well as a lengthy Synopsis of Bible Doctrine are all worthy of note. This is probably the most consistently annotated study Bible available, both qualitatively and doctrinally. A Popular Systematic Guide to Understanding Biblical Truth With his clear understanding of the Scriptures and unpretentious writing style, Charles Ryrie has written Basic Theology for every student of God's Word, from the devotional to the seminary student. Featuring charts, definitions, Scripture and subject indices, Basic Theology will give you a clear and comprehensive picture of Ryrie's approach to systematic theology. Its 94 chapters are arranged in outline style for easy reference. Considerable emphasis is given to explaining the dispensational view of the end times. What it Means to Believe in Jesus Christ What is the Gospel? Confusion about the Gospel is a serious problem of tremendous magnitude. It's not just semantics. It's the eternal difference between heaven and hell. But there is Good News... Follow along in this scholarly yet readable work as Dr. Ryrie carefully explains what the Bible has to say about salvation, discussing man's hopeless state before meeting Jesus, God's grace in saving us, and our call to obedience as we walk with Him. In So Great Salvation, Dr. Ryrie also addresses many questions raised by those who hold to the lordship salvation position. Does Jesus have to be the Lord of every area of our lives before we are saved? What about lapsed Christians? What is 'easy-believeism?' Join Dr. Ryrie as he studies the important topic of salvation. Discover how God's grace is all we need to enter the kingdom of heaven. "Every once in a while a new book will appear on the market with a title something like this: How I've Changed My Mind. The various chapters then detail the ways in which the author's thinking has changed (often about important doctrines) throughout his lifetime. The apostle Paul would never have written such a book. Here's why we can be certain of that. Although among the earliest of Paul's letters (only Galatians is earlier), 1 and 2 Thessalonians in no way exhibit undeveloped or immature thinking. Paul had been a Christian for seventeen or eighteen years by the time he wrote 1 Thessalonians. His theology was fully developed in his mind and tested in his ministry before he wrote these letters to the Thessalonians. These epistles are like finely cut gems. They reflect the depths of theological thought, especially in the area of future things. They mirror the pattern of teaching that the apostle used with new Gentile converts. Revised and expanded edition Dispensationalism continues to provoke heated debate within the Christian world. Highly acclaimed theologian Dr. Charles C. Ryrie addresses this crucial issue from the perspective of classic dispensationalism. He confronts the views of covenant theology, historical premillennialism, ultradispensationalism, and, in this revised edition, the increasingly popular progressive dispensationalism. In his best-selling book Dispensationalism Today, written more than thirty years ago, Dr. Ryrie made this complex subject more understandable for thousands worldwide. This revised and expanded version of that book will prove to be an invaluable reference tool for your library. Revised and expanded edition The book of Revelation, according to Charles Ryrie, was 'designed not to mystify but to clarify.' This refreshing and concise new edition, with its helpful charts and graphs, is written especially for those who want to understand and effectively teach what lies ahead in God's plan. Dr. Ryrie's careful attention to detail and understandable explanations will not only help to clear some of the mystery surrounding the book of Revelation, but heighten your confidence that God's victory over Satan, death, and sin is only a matter of time. Secrets to blending your relationship with God into all areas of your life Genuine and wholesome spirituality is the goal of all Christian living.What sounds simple, Ryrie warns is at risk from 'an unbalanced application of the doctrines related to spirituality resulting in an unbalanced Christian life.' The answer to preventing unbalance is to know how to study the Bible in such a way as to let it 'be the guide and test for all our experiences in the spiritual life...and if any experience fails to pass the test, it must be discarded.' In this foundational work for all believers, Ryrie examines key issues of spirituality, including sanctification, temptation, routine faithfulness and use of spiritual gifts. A masterful exposition of every important aspect of church government, evangelism and mission A commentary and study guide designed for laypeople, this work deals seriously with the biblical text on the Acts of the Apostles without being overly technical. Introductory information, doctrinal themes, problem passages and practical applications are examined. If you have wondered when and what prompted Paul to use his Roman name in place of his given Jewish name Saul, you will find that and many other fascinating background facts in Ryrie's Acts of the Apostles. Key doctrinal concepts provide excellent material for sermon and teaching preparation This is an easy-to-understand overview of the various doctrines of the Bible written especially for the layperson. Ryrie examines a wide range of topics, including: the nature of God, the inspiration of Scripture, Christ, the Holy Spirit, the angelic world, the nature and depravity of humans, salvation, the church, and the end times. Ryrie argues for the contemporary relevance of the Bible in this accessible and engaging survey of its key teachings.